We stock Fine Quality instruments, modern second-hand and restored older instruments, with prices starting from as little as £490 including delivery. We offer a wide variety of choice. Uprights and elegant grands. Traditional and modern, with on site workshop and our main technician having over 35 years experience of rebuilding, tuning and learning about pianos as well as learning about what our customers need, being able to find a piano to match their abilities as a player as well as matching the right piano to the environment it will be living in. A variety of finishes available, from traditional French Polish to modern high gloss. 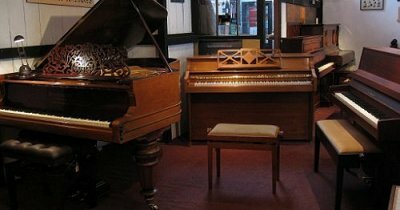 The premises, parts of which date back to the 16th century, consist of our workshop and several showrooms, where we have on display not only pianos but a wide variety of accessories, including stools and second-hand music. 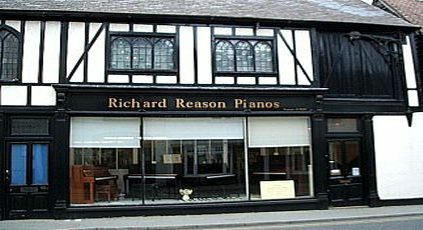 The final price of a piano includes free delivery (30 mile radius, ground floor premises, this covers most of Herts & Beds and areas of Cambridgeshire and Bucks), a complimentary tuning and full guarantee. We are able to offer nationwide delivery at a competitive additional charge. Restoring The pianos are restored mainly in our own workshop with a little help from others with polishing and tuning. 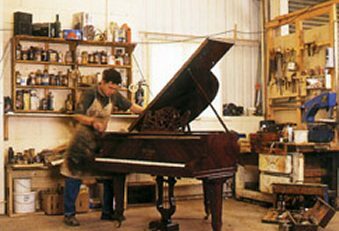 Rupert has been working here since qualifying in Piano restoration & tuning in 1985. We also offer a comprehensive restoration service should you want your own piano brought back to life. No job too big or small. Tuning service All pianos should be tuned regularly (Twice a year is recommended by all manufacturers). Please call to make an appointment with one of our tuners, Its just £70.00 for a standard local tuning. Rentals We run a very popular rental scheme to help you get started. All our rentals include 2 tunings per year, a stool and with starting prices from just £25 per month there is no need to wait any longer. Click on the Rental section in the menu on the left for more information or give us a call. We are keen to help locate and buy second-hand stools as well as pianos, please call us if you have any you no longer want. Please visit us and see for yourself.